Setting out to paint a portrait of "a thriving democratic nation and the forces that threaten to bring about its demise," Abigail R. Esman's recent book, Radical State: How Jihad is Winning Over Democracy in the West published by Praeger Books is a gripping account of the threat posed to the global community by radical Islam. As I sat there reading it, the vivid threat that we face became ever more obvious—as was the need for Americans to strengthen their resolve and battle the enemy we face. Focusing her narrative on the Netherlands, Esman describes—with the vivid details of somebody who has experienced the threats of militant Islam first hand—how Holland lost its freedom to the terrors of jihad. She then chillingly shows how the rest of Europe and the United States are moving towards a similar fate. Drawing from interviews, news, and personal experiences, Esman tells a dramatic and frightening story of what happens when Western countries cede their ideals to Islamists. Esman, a journalist who has written for both national and international publication, describes the war on terrorism as a "war for freedom." She begins by tracing the historical development of Islamism in Holland from the country's first Muslim immigrants to the vicious 2004 murder of film maker Theodore Van Gogh. Describing the Netherlands as one of the most stable and tolerant nations in Europe, Esman concludes that the spread of Islamism and the threat it poses to democratic values is largely a self-inflicted wound. Radical State describes how Muslims traveled to Holland fleeing persecution in their native lands and established their own communities. And while the authorities allowed such communities to flourish, the result was self-contained centers where radical Islam took root, like weeds threatening a garden. Esman cites as evidence, the Muslim Brotherhood's dominant presence in the country since the 1980s and the extensive network of Saudi-funded Wahhabist schools throughout the country. Two horrific examples that are demonstrative of threat, Esman suggests, are the stories of Theodore Van Gogh and Ayaan Hirsi Ali, individuals from different worlds who came together in the Netherlands to fight extremism only to be punished for it by radical Muslims. Esman tells their respective stories and of their joint venture—the film Submission. Together, the two stood up to the some of the worst practices within Islam—honor killings, genital mutilation, and the refusal of Islam to yield to democracies. "radical Islam had been allowed to flourish unhindered, as politicians turned their heads and failed to absorb responsibility. The mosques and religious schools the state had refused to fund had found eager sponsors in Saudi Wahabbist leaders, who often sent their own imams to run them. Journalists made their way in to them and reported, in a press eager for sensation and not yet intimidated by reprisals, what they found." And as anybody who has followed the threat posed by militant Islam may remember, it ended with the brutal murder of Van Gogh in broad daylight on a city street in Holland and Ali being forced into hiding out of fear for her own life. Reading Esman's fascinating book, one thing is clear. The "tolerance" practiced by Holland allowed Islamists to flourish, undermining not just the Netherlands, but Western society and its freedoms generally. More frightening is that the threat is not abating. While the governments in Europe may have been willing to ignore the threats, they are not going away. As Esman points out, the problem is not limited to Holland, as countries like France, Great Britain, and the United States would face their own uprisings from the radical Islamists that had been moving into these respective countries. "It's time we stopped saying 'OK, we abhor their methods, but we kind of see something in their ideas or maybe they've got a sliver of excuse or justification.' They've got no justification for it." But the threat has not abated in Great Britain. Esman cites British officials who estimate that as many as 3,000 British Muslims have trained with al Qaida in the years since the September 11 attacks. "In the United States, as in Europe, the Islamist threat is double-edged: violent and ideological. Ultimately, both point to the same goal: the establishment of an Islamic state, a planting of the flag of Islam where the flags of democracy now wave. Although the "terrorism" we hear about is the kind that invokes death and destruction, bombings and burnings and shootings, there is another kind of jihad, a more insidious, quiet version." The U.S. has seen a dramatic spike in homegrown terrorist plots by Islamist radicals since 2009, from successful attacks like the Fort Hood massacre to failed attempts like the attempted Times Square bombing or Najibullah Zazi's plot to attack New York transit hubs last year. The increasing prevalence of domestic terrorism and the expanding reach of Muslim Brotherhood front groups in the United States, Esman argues, are indicative of the threat posed by radical Islamists. And like the Netherlands, the United States must recognize the threat and begin to counter it before it is too late. "We must stop behaving as if democracy is negotiable. It is not. We cannot bend to a limitation of freedoms, simply in the name of freedom in itself. We must demand a hierarchy in which democratic values of dignity and respect and liberty remain paramount. This is the paradox of democracy-a paradox made greater by the fact that, while in itself a demand for hierarchy in a system based entirely on equality appears hypocritical, the failure to meet that demand is even more so." I issue another. 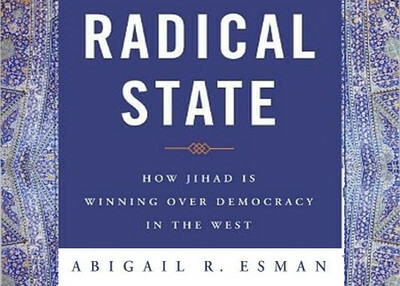 Go out and get Abigail Esman's compelling book, Radical State: How Jihad is Winning Over Democracy in the West. Freedom is given to people who does not violating the seed of freedom itself. In islamist group there is no seed of freedom but they only have seed of hate and facistm. No choice, people who want to perserve seed of freedom must fight against such islamist people, do not give such freedom to them.